Chocolate Fortress is a level in Super Mario World located in Chocolate Island. In this level, the player faces enemies such as Dry Bones, Thwimps, and Thwomps. At the end of level, the player fights the Reznor. It can be accessed through the completion of the level Chocolate Island 3. By completing this level, the player gains access to Chocolate Island 4. 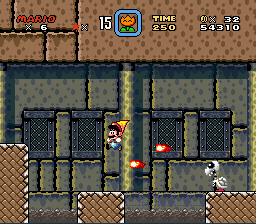 In the beginning, the player starts off with encountering the wooden Spikes and one Dry Bones that throws a bone at Mario. After that, the player finds more pencil pillars that go up and down, as well as Bowser Statue flames. There is also a ? Block with a Cape Feather. The player must avoid hitting the edge of the pencil pillars, as well as the Bowser Statue flames. At the end of the first room, there is a midpoint section as well as a door that leads to the next. The next door leads to a place with four Thwimps, and two Thwomps. There is a short fall that leads to more Thwomps, as well as more power-ups. The player must then continue heading to the right, where they find more Thwimps and Thwomps. A few of them can be avoided by activating the Red and Blue Switches. At the end of the second room, there is a boss door and a green ! Block. The player must enter the boss door to fight the four Reznor. The lava and boss door in this fortress are recolored to match the "chocolate" theme of the world. However, the boss door is still colored red in the Game Boy Advance version. This is the only Reznor fight that is required to beat the game (if it is played linearly). This is the only Fortress in the SNES version that has a midway gate. This is also the only Fortress that can be accessed without a secret stage.